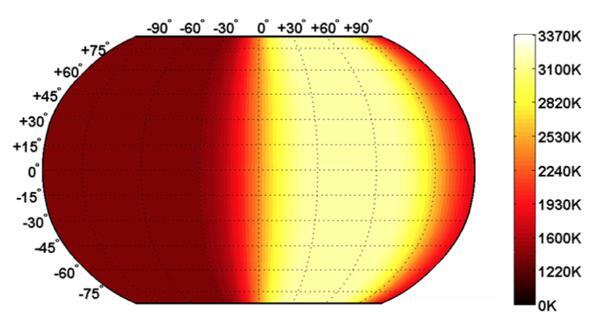 55 Cancri e surface temperature mapped for the first time. An asrtist’s drawing of what 55 Cancri might look like, including an odd “hot spot” on the surface that isn’t understood just yet. Forty light-years from Earth lies the binary star 55 Cancri, a cool red dwarf (55 Cancri B) orbiting a star not too different than the Sun (55 Cancri A), though about twice as old. And orbiting closer in to this Sun-like star are at least five planets. One of them, called 55 Cancri e, is basically hell. It has a radius less than twice Earth’s, and just over eight times our mass. That makes it a super-Earth, bigger than us but smaller than a gas or ice giant like Neptune. It’s a bit denser than Earth, and the surface gravity is more than twice Earth’s too. It orbits the star on a very tight path, just a couple of million kilometers over the star’s surface. It screams around the star so quickly its year is a mere 18 hours long. 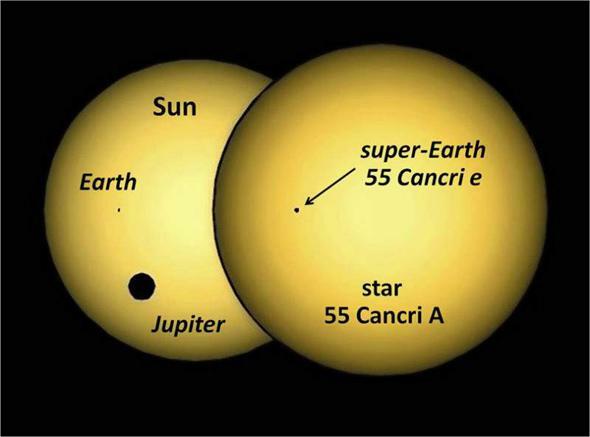 A comparison of the Sun, Earth, and Jupiter (left) to the star 55 Cancri A and the planet 55 Cancri e.
And it’s hot. Really hot. How hot? Well, that depends on what you mean. For the first time, astronomers were able to map the temperature changes across the planet, and what they found is that 55 Cancri e is a place you really, really don’t want to be. It’s 1,100° C (2,000° F) there … on the night side. But wait! It gets weirder! Bear with me; this’ll take a moment to explain. The planet orbits the star so closely that from Earth, we see it pass physically in front of the star once per orbit (called a transit) where it blocks a fraction of the star’s light, and then passes behind the star half an orbit later so the star blocks the planet. Over the course of an orbit the planet undergoes a complete set of phases as seen from Earth, like the phases of the Moon. When it’s in front of the star it’s “new,” and we see its unlit backside. As it circles around it’s a crescent, then half full, then gibbous, then full … but when it’s exactly full, it’s behind the star. Then it pops out again, and we see the phases in reverse. We don’t see the phases, actually. The planet is too far away from us and too close to the star. But as it undergoes these phases, the amount of light we see from the planet changes. Incredibly, using Spitzer Space Telescope (and some pretty fancy data processing techniques), a team of astronomers was able to measure this teeny change in the light from the planet. As the planet orbits the star, the amount of light we see from it changes with the angle. This is called an orbital phase diagram. Along the horizontal axis is time in units of one orbit. In that case, 0 is when the planet is directly between us and the star, 0.25 is a quarter of the way around, 0.5 is when it’s directly behind the star, and 1 is when it’s back in front of the star again. The y axis is brightness, such that 0 is when we only see the star (the planet is hidden). 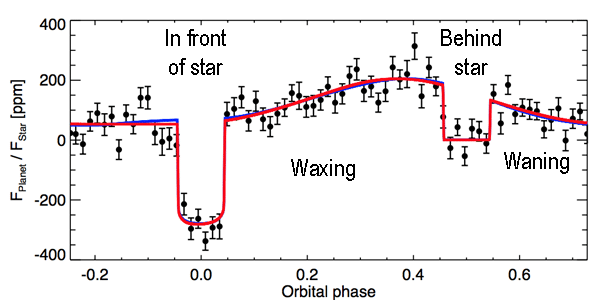 So at x=0, the total light is lower because the planet blocks starlight; at x=0.5 we see just the star, and in between we see the planet plus the star. Right away, you can see that graceful long up-and-down curve of light across the whole plot. That’s the light of the planet changing with its phase! If we were just seeing the star, that would be a flat horizontal line. But as the planet circles around to the back side of the star its phase increases, and we see more light from it. The reverse is true as it comes back around. Right away, that’s pretty boggling. We’re seeing the change in light from a planet 400 trillion kilometers away! Wow! But this is where the weird part comes in. The planet is so close to the star that the gravity (really, the tides) from the star should lock the planet’s day to its year, so that it spins once every 18 hours as it goes around the star once every 18 hours. The brightest spot on the planet should be directly under the star, what’s called the substellar point. That faces us right before the planet goes behind the star, so the whole system should be brightest when the planet is just about to be blocked. But look closer. The brightness does peak before the eclipse, but then it dips a little. That means the brightest spot on the planet is not the substellar point. For some reason, the hottest part of 55 Cancri e is about 40° east of that point. A temperature map of 55 Cancri e (in Kelvin; subtract 273 to get Celsius). The yellow part is hottest, and you’d expect it to be centered at 0° longitude (directly under the star), but it’s offset 40° to the east. That’s a really good question. The astronomers provide two possibilities. One is that the planet has a dense atmosphere, and is redistributing the heat from the star around the planet, and for some reason that has moved the hot spot. What could such an atmosphere be made of? Hydrogen is very light, so it escapes the planet’s gravity easily (it helps that the planet is really hot, increasing the speed of the molecules to make it easier to escape). In fact no hydrogen has been detected. So the air there might be something much denser and heavier, like vaporized silicates—yes, rock so hot it’s turned into a gas. It would expand on the day side, blow around to the night side, and condense as clouds. Rocky clouds. I suppose that might be similar to a volcanic ash plume. But an atmosphere efficient enough to move the hot spot so far east should be able to heat the night side of the planet too, yet we see that huge 1,300° C temperature difference. So that’s not consistent. The second possibility is that 55 Cancri e has no atmosphere. In that case the hot spot might be lava flows, molten rock that flows east (or perhaps a volcanic vent at that 40° east location). However, that’s pretty speculative. It might very well be the reason, but at the moment there’s no way to tell. The planet’s a long way away, and we can barely detect it at all. Still, this is all pretty amazing. We only discovered 55 Cancri e in 2004, and only started getting a decent understanding of it in 2011. Its light was teased out from the star’s just a year after that. So our exploration of this weird exoplanet has just begun. But we’re already doing so much! Measuring its temperature, and mapping its surface; being able to tell that one side is hotter, and the heat is off-center. Just being able to do this at all is simply amazing. Not too long in the future we’ll have the James Webb Space Telescope to look at planets like these, and ground-based telescopes equipped with more sensitive detectors as well. We still won’t be able to resolve these exoplanets, see them as disks, but we’ll still learn a vast amount about them. 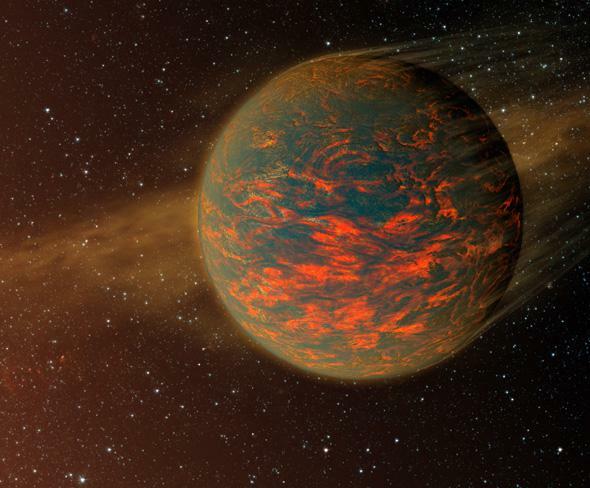 55 Cancri e may be our version of hell, but for astronomers it’s a delight: A place where we can test our skills, our knowledge, and our hypotheses of how planets form and how they behave. All that, from a tiny spark we can’t even see with our eyes. * The uncertainties in those temperatures are only a few hundred degrees, so the difference is quite real.